Scooper - Technology News: Like your brain, but smaller: what are neural networks? Like your brain, but smaller: what are neural networks? The origin of modern ANNs is based on a mathematical model of the neuron called the perceptron , introduced by Frank Rosenblatt in 1957. As can be seen below, the model closely resembles the structure of the neuron with inputs resembling dendrites (a short extension of a neuron that transmits electrochemical signals from one neuron to another). In the original model made by Warren McCulloch and Walter Pitts , the inputs were either 0 or 1. Each dendrite/input also had a weight of +1 and -1. The input was thus multiplied by its weight, and the sum of the weighted inputs was then fed to a model. The perceptron thus takes several binary inputs, (I1, I2… IN), and produces a single binary output which is the weighted average of the multiple inputs. If the cumulated output is greater than a set threshold level, then the model delivers a certain output. In other words, output = 0 if the result is smaller than or equal to the threshold; output = 1 if the result is larger than to the threshold. By following this method, a perceptron in the second layer can decide at a more complex and more abstract level than the perceptron in the first layer. If a third layer is involved, then the decisions can be made by those perceptrons will be even more complex. 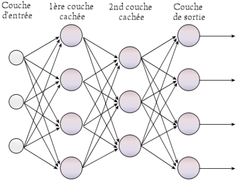 In this way, a “deep”, many-layer network of perceptrons can engage in sophisticated decision making. The greater the number of layers of perceptrons, the higher the decision-making ability, something that is applicable in a number of areas . But with deep learning, the unlabelled data can be analysed, patterns founds and insights gained. This helps in getting a better understanding of the correlations between various data sources and in making predictions. For example, by applying deep-learning methods to finance , researchers have been able to produce more useful results than standard statistical and economic models. Deep learning has been used to detect and exploit interactions in the data that are, at least currently, invisible to any existing financial economic theory.